There have been seven episodes of “Saturday Night Live” during the first 100 days of Donald Trump’s presidency, and the program’s been handed plenty of material by the administration, from the president’s tweeting and press secretary Sean Spicer’s gaffes to Stephen Bannon’s perceived influence behind-the-scenes and Jared Kushner’s sunglasses-and-blazer fashion statement in Iraq. The most consistent "SNL" target is the president himself, played by Alec Baldwin on five of the seven episodes. When Trump's travel ban got stymied in the courts, "SNL's" Trump took his case to "The People's Court." On another episode, Baldwin's Trump spoke to supporters worried about their jobs by comparing his followers to people who "find a finger in their chili" but eat it anyway. After Trump wore a flight jacket while speaking to members of the Navy, "SNL" parodied the commander in chief by having Baldwin give a less-than-inspirational speech during an alien invasion. Baldwin also branched out, playing both Trump and ousted Fox News host Bill O'Reilly on a split screen in a "No Spin Zone" segment. "He's gone from funny to mean and that's unfortunate," Spicer told "Extra" back in February. "'Saturday Night Live' used to be really funny and I think there's a streak of meanness now that they've kind of crossed over into." Of course, audiences became familiar with Baldwin’s Trump long before the inauguration — he’d been making "SNL" appearances since before the election, facing off as a presidential candidate in debates with Kate McKinnon's Hillary Clinton. Baldwin's parody had become a mainstay by the time the real Trump took office. Melissa McCarthy, not Baldwin, became the surprising breakout star of the first 100 days of "SNL’s" Trump administration in playing Spicer. McCarthy first showed up, unannounced, on the Feb. 4 episode to riff on Spicer’s first press conference, during which the public face of the White House took an adversarial stance toward the press corps. Spicer had scolded the media for “deliberately false reporting.” One instance referred to an incorrect tweet from a pool reporter that a bust of Martin Luther King Jr. had been removed from the Oval Office. It hadn't, and the reporter had apologized. Spicer also criticized reports on Trump's inauguration crowd size. On "SNL," McCarthy played up Spicer’s defensive stance. “Now I’d like to begin today by apologizing — on behalf of you, to me, for how you have treated me these last two weeks. And that apology is not accepted. Because I’m not here to be your buddy. 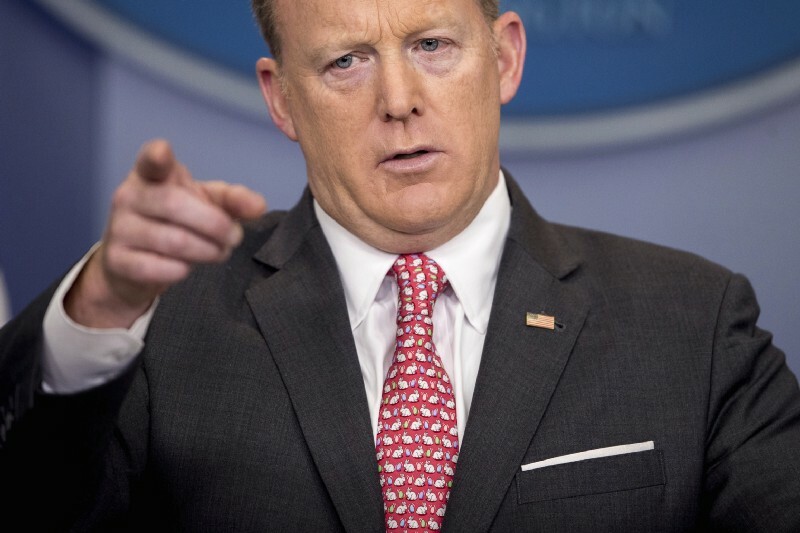 I’m here to swallow gum, and I’m here to take names,” she said, the gum being a reference to Spicer’s reported fondness for downing pieces of Orbit. She ended the press conference by shooting a reporter with a water gun for asking about the White House’s statement on Holocaust Remembrance Day that didn’t mention Jews. 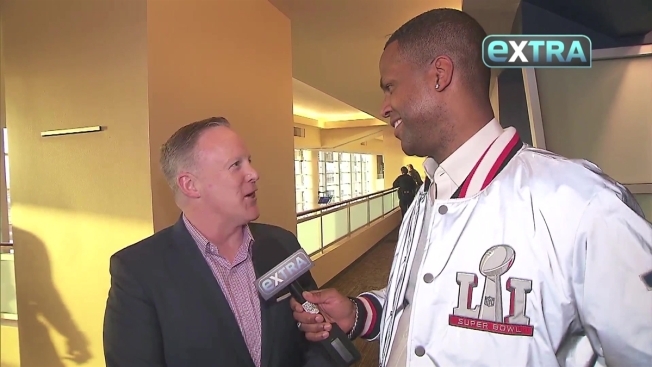 Real-life Spicer responded to the portrayal in an interview later with "Extra." He said it was funny, but over-exaggerated — presumably what "SNL" was going for. He offered some seemingly good-natured advice for McCarthy, suggesting she tone it down on the gum. McCarthy returned for her second of three appearances the following week. “I have been told that I am going to cut back on the gum chewing, so I’ve cut back to one slice a day,” she said, just before pulling out a giant stick of gum. This time she used a leaf-blower on a reporter in response to a question about the president’s statements on Chicago’s murder rate. “That was me blowing away their dishonesty,” she said. Robert Thompson, a professor of television and popular culture at Syracuse University, said it’s unusual that the press secretary would become the central person in the comic pantheon of an administration. But in Spicer's case it was “inevitable,” he said. That's because Spicer appears on television every weekday, then his performance is aired and re-aired and repackaged by networks, cable news and late-night shows. McCarthy’s third Spicer spoof came the Saturday after the real Spicer made an inaccurate, off-base remark on Passover in which he suggested Hitler never used chemical weapons on his own people. He’d been trying to highlight Syrian President Bashar al-Assad’s inhumanity. Spicer tried to clarify his intentions throughout the day but kept flubbing it, referring to concentration camps as “Holocaust centers.” By the evening he admitted to his mistake and asked for forgiveness. McCarthy appeared that week as Spicer in an Easter Bunny costume. Not only was it the night before Easter Sunday, but Spicer had previously played the role of Easter Bunny at the White House Easter Egg Roll during the George W. Bush administration. "SNL's" Easter Bunny begrudgingly admitted that she’d done wrong. “You all got your wish this week,” she snarled. “Spicey finally made a mistake.” She clarified that she of course meant to say “concentration clubs,” not Holocaust centers then climbed into a car shaped like an Easter egg shell and crashed it into her podium. There have been other standout Trump administration characters since Jan. 21. The makeup department transformed Kate McKinnon into Attorney General Jeff Sessions, who was portrayed as Forrest Gump, offering chocolates to passengers waiting at a bus stop and occasionally making unsolicited confessions about his meetings with Russians. This came after the revelation that the newly appointed attorney general had neglected to let lawmakers know during his confirmation hearing that he had met with Russia's top diplomat during the Trump campaign when he was a prominent adviser. Early into the first 100 days, McKinnon played Kellyanne Conway “Fatal Attraction”-style in an attempt to get CNN's Jake Tapper to give her airtime. The "SNL" sketch came after CNN reconsidered its booking of Conway over credibility issues. “You don’t get it, Kellyanne. You made up a massacre. We can’t have you on,” Beck Bennett said as Tapper. Other characters, whose roles in the administration’s first 100 days have been more behind-the-scenes, made recurring appearances on "SNL." Vladimir Putin, the Russian president and possible election-meddler, was played week-after-week by a greased-up, shirtless Bennett. Trump's chief strategist Stephen Bannon was portrayed as a grim reaper/puppet-master figure at the helm of the Resolute desk. Baldwin's Trump, by contrast, was relegated to a kiddie desk. But with Bannon's perceived influenced waning by April amid reports of a West Wing power struggle, "SNL" had Baldwin's Trump choose son-in-law Jared Kushner in a reality show-style showdown over who would occupy the Resolute desk. Jimmy Fallon, who played Kushner while hosting "SNL" on April 15, stayed mum and wore a stylish outfit underneath a flak jacket, in a mocking reference to the real Kushner's visit with ground troops in Iraq. Then, there was the pre-taped commercial parody for a fictional Ivanka Trump (played by host Scarlett Johansson) fragrance called “Complicit.” CBS' Gayle King referenced the sketch while asking the real Ivanka Trump whether she felt “complicit” with what happened in the White House. Ivanka Trump replied that, "If being complicit is wanting to be a force for good and to make a positive impact, then I’m complicit." If Ivanka Trump's reaction to "SNL's" ribbing was lukewarm, Spicer has seemed to take McCarthy’s jabs in stride. He was seen wearing an Easter bunny necktie during the press briefing the Monday after the Easter bunny episode aired. President Trump hasn't shown the same penchant to laugh at himself. That contrasts with former President Gerald Ford, who wrote the book on humor and the presidency. Ford was repeatedly lampooned as an oafish klutz by Chevy Chase on "SNL" in the 1970s, in the program’s earliest days. Ford responded by making a cameo on "SNL". Of course, quantifying humor isn’t a science, and the jury is out on how effective Trump has been in his first 100 days. Trump's approval with 82 percent of Republicans is strong, though nearly two-thirds of Americans overall give him fair or poor ratings, according to NBC News. "SNL," for its part, is having its most-watched season in 23 years.